Going to an office where the editor’s chair is occupied by an unassuming man who just happens to be the only Indian motorcycle racer ever to have completed the fearsome Isle of Man TT and who raced in circuits around India for about two decades before becoming an automotive journalist is exciting. Talking to him, having him recount his experiences of racing back in the day do provide glimpses into what a motorcycle racer’s life is like. Nothing, however, can be a genuine substitute for the real thing. So trying my hand at racing a motorcycle around a racetrack with others fighting for my space is something that I’ve always wanted to do. At least once. Just for the experience of it, not to mention the thrill. At the age of 35, however, it was time to pack that dream away in the loft. Frankly, what were the chances that anyone would let someone like me out on a racetrack with their precious machine to compete with other riders? Shockingly enough, Honda emerged as the brave saviour of delinquent (and ageing) auto journalists with a secret desire to go racing. 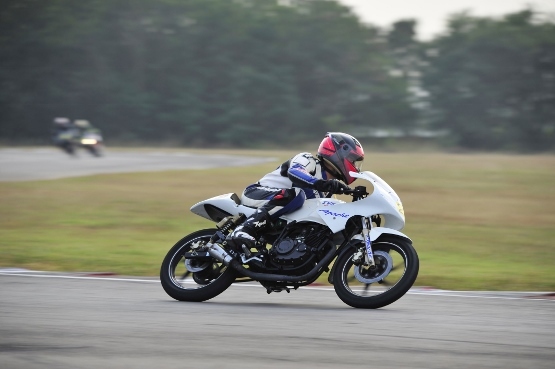 They actually invited a bunch of us to Chennai to cover the final round of the Honda MMSC One-make Race Championships and while we were at it we would get the chance to race each other around the MMRT. And guess what? It wouldn’t be a couple of laps just to indulge us. We would be exposed to the full race experience. We would be trained in race craft under the able guidance of Ten10 Racing director Ramji Govindrajan, go through a proper round of free practice, work our way to a grid position through the arduous task of qualifying and then race each other to the chequered flag. Not once, but twice!